The conflict between the Ife and Modakeke appears to be a protracted and seemingly intractable intra-ethnic conflict that has continued to pit two groups of the same ethnic background against one another. 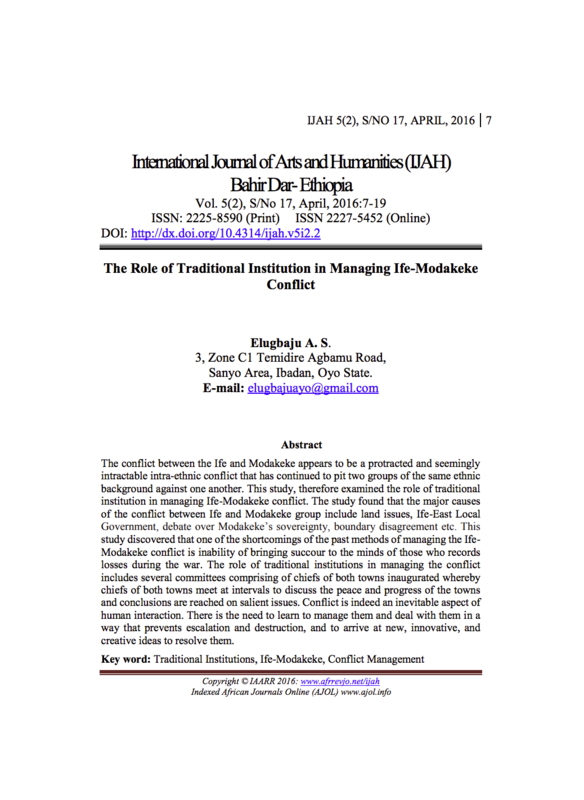 This study, therefore examined the role of traditional institution in managing Ife-Modakeke conflict. The study found that the major causes of the conflict between Ife and Modakeke group include land issues, Ife-East Local Government, debate over Modakeke’s sovereignty, boundary disagreement etc. This study discovered that one of the shortcomings of the past methods of managing the Ife-Modakeke conflict is inability of bringing succour to the minds of those who records losses during the war. The role of traditional institutions in managing the conflict includes several committees comprising of chiefs of both towns inaugurated whereby chiefs of both towns meet at intervals to discuss the peace and progress of the towns and conclusions are reached on salient issues. Conflict is indeed an inevitable aspect of human interaction. There is the need to learn to manage them and deal with them in a way that prevents escalation and destruction, and to arrive at new, innovative, and creative ideas to resolve them.